Posted 16.09.2016 at 02:09 in blog by admin / Comments Off on How Can Dental Lamination Brighten My Smile? Cosmetic dentistry treatment procedures aim at the enhancement of your face profile with the help of specialized equipment and innovative materials which can brighten your natural teeth by removing or masking stains, discolorations, mal-alignment and rotated teeth. Whiter and brighter teeth can increase your success rates at work places and can help your child excel in his educational endeavors by boosting confidence levels and self-esteem. Call to know more about Albuquerque New Mexico Dental Lamination. Even minor cosmetic defects and abnormalities affecting your front teeth which are displayed during smiling, talking, eating, drinking and laughing can be a cause of social embarrassment in social meetings and family weddings. Simple teeth cleaning procedures can easily remove stains and discolorations from external tooth surfaces but pigments incorporated within the tooth structure, decayed front tooth surfaces and mild mal-alignment of teeth require more invasive treatments. Albuquerque New Mexico 24 hours emergency specialist cosmetic & restorative dentist Dr William C Gardner at NM Family and Cosmetic Dentistry PC has the right solution for all these problems in the form of dental porcelain laminations through provision of dental veneers. Call to know more about Albuquerque New Mexico Dental Lamination. Q. WHAT ARE DENTAL PORCELAIN LAMINATES OR PORCELAIN VENEERS? 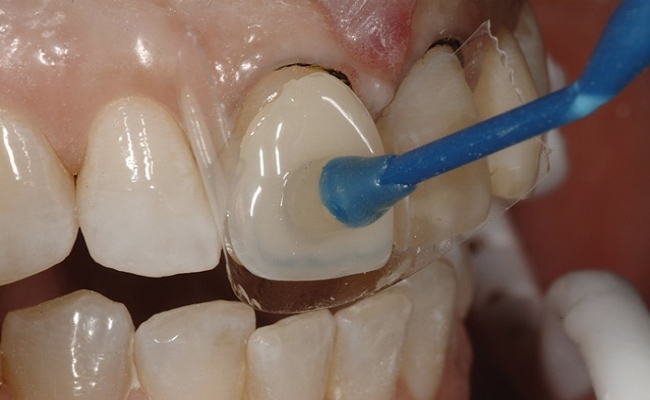 A. Porcelain tooth laminations are basically extremely thin, shell-like structures which are especially fabricated mimicking the front teeth surfaces. Once placed over the stained, discolored and darkened teeth, these laminations mask these irregularities imparting life-like brightness to your teeth. Mild degree mal-aligned teeth can also be corrected with this dental prosthesis. Q. WHEN CAN I OPT FOR PORCELAIN VENEERS. • For increasing the length of small and short teeth. Call to know more about Albuquerque New Mexico Dental Lamination. Q. HOW CAN I GET BEST PORCELAIN VENEERS IN ALBUQUEQUE NEW MEXICO? A. Dr William C Gardener specializes in the provision of state of the art latest dental porcelain laminates working in collaboration with highly trained dental laboratory technicians. He will take your complete medical and dental history followed by comprehensive visual and radiographic examination in order to confirm definitive diagnosis and need of dental veneer placement on your teeth. Following your informed consent, two stage treatment procedure will be performed. The first dental visit will include preparation of your teeth for minimizing discolorations, reducing tooth mal-alignment and creating space for the veneer shell which may require removal of tooth structure. An impression of your teeth will be recorded and model will be sent to the dental laboratory for the fabrication of dental veneers according to your teeth dimensions. Well-fitting porcelain veneers will be cemented on your teeth on the next appointment in the dental office. Call to know more about Albuquerque New Mexico Dental Lamination. Q. WILL I FEEL PAIN DURING THE PROCEDURE? A. The whole procedure is under profound local anesthesia in a calm and friendly environment. Topical gel helps the area of needle prick as well. We have conscious sedation equipment in place in the dental office for anxious and phobic persons for calming their nerves. Thus, what are you waiting for? Give us a call now. Q. HOW LONG WILL MY VENEERS LAST? A. Dental porcelain veneers have adequate life expectancy ranging from approximately seven to twenty years. Life expectancy can increase with good care and maintenance. Call to know more about Albuquerque New Mexico Dental Lamination. Q. HOW PORCELAIN VENEERS ARE BENEFICIAL FOR ME? • Save natural tooth structure in comparison to crowns. Q. WHAT SHOULD I DO FOR INCREASING THE LIFE OF MY VENEERS? • Avoid excessive intake of acidic beverages such as cola drinks which have the ability to abrade porcelain. Because these cause excessive damage to the teeth. • Refrain from pencil chewing, ice chewing, nail biting and such habits because it doesnt help. • Visit your dentist regularly for evaluation and assessment of your porcelain laminations at least twice a day. Call to know more about Albuquerque New Mexico Dental Lamination.